Public key authentication has long been considered one of the most secure methods of remote SSH authentication. However, using the same key-pair for more than one machine can pose security risks, especially if that key is not secured by a passphrase but managing unique keys for each system a user has access to can be nightmare inducing. For this reason, we have leveraged Active Directory as our SSH public key store. For the purpose of this article, you should already have your Linux machines pulling user data from Active Directory, you should be running Windows Server 2012 R2 and you should have access to your domain Administrator user. 3. In the Registry Editor, we need to enable Schema updates. 4. Back in your Administrator command prompt, run regsvr32 schmmgmt.dll to enable the Schema Editor Snap-in. II. For ‘Common Name’ and ‘LDAP Display Name’, enter ldapPublicKey. IV. For Parent Class enter ‘top’ and for Class Type select ‘Auxiliary’. We can now associate that class to user objects. I. Expand Classes and right click User then select properties. Once complete, browse to a user and select the ‘Attribute Editor’ tab. You will now be able to add public keys to this user. From here, you should create a script to automatically pull public keys from AD for a given box and schedule it via Cron. Please remember to disable your domain Administrator account when you’re done! Your instructions say to use sshPublicKey, but your screenshot says to use sshPublicKeys – which one is it? Good catch! The typo has been updated to `sshPublicKeys`. How would you expect users to maintain their keys? Is there any documentation that might help role out this functionality across a large number of seats without increasing support cases? That’s a very good question! We will be creating a new post later on this month discussing a solution for this. Ideally, we will allow users self write to their AD SSH keys and create a PowerShell script for Windows users to manage their keys and a Python script for Linux/OS X users. We’ll follow up when the post is online. Hey, really nice posts.. just a remark and two questions. 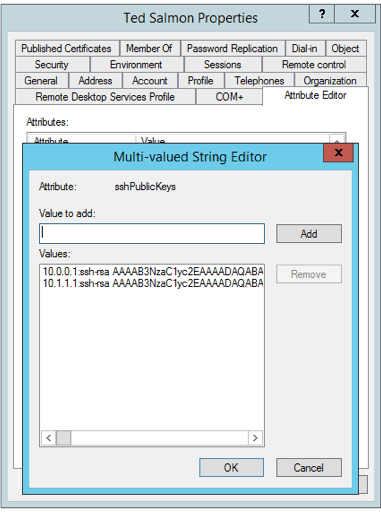 R) For the sshPublicKeys attribute you *write* that Multi-Valued should be checked. But it’s not checked in the screenshot, so that might confuse some people (like me at first). Q1) Why are you using sshPublicKeys instead of sshPublicKey? I have seen quite a few other tutorials that do similar things and it’s almost always sshPublicKey. Does it matter at all? Q2) Hope I didn’t overlook anything, but I didn’t see how the SSH keys are then used.. e.g. would you have a sample for the cronjob or SSHd AuthorizedKeysCommand? Thanks for the note regarding the screenshot – we’ll get it updated! Regarding the pluralization of PublicKey – it’s a matter of preference. We have it pluralized because most of our users actually have multiple public keys stored due to our key policies, so it just kind of made sense. If you’re only using one key, singular may make more sense. I decided to use a less “sophisticated” approach because in our environment we are not using separate keys per hosts.